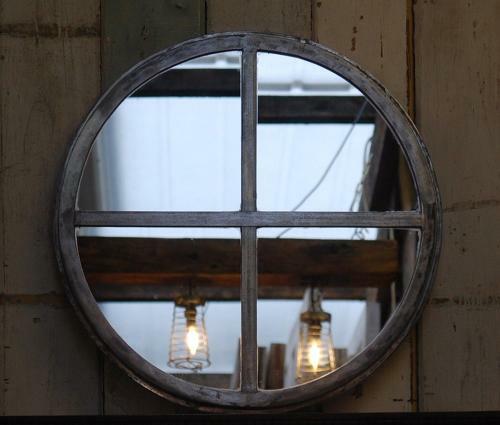 A fantastic upcycled circular mirror, made using an antique crittall window. The window frame has been fitted with new mirror glass to create a wonderful statement piece. The frame retains its original features and has great character. The window has an industrial style feel and the metal has been cleaned and lacquered giving an attractive, burnished, silver finish. The mirror glass is new and intact but there are some slight signs of use and wear on the frame due to age. There are some small patches of surface rust, tarnish and wear that add to the industrial look. The metal has some light scratches, knocks and marks. Some slight scratching and marks can be seen. There is a small chip to the outer frame and some slight flaking. The mirror is a very unusual and stylish piece and its history and original characteristics give a fashionable upcycled feel. A solid, well made and desirable mirror. Diameter (outside edge) 51cm approx.